Exchanging contracts on our new house. 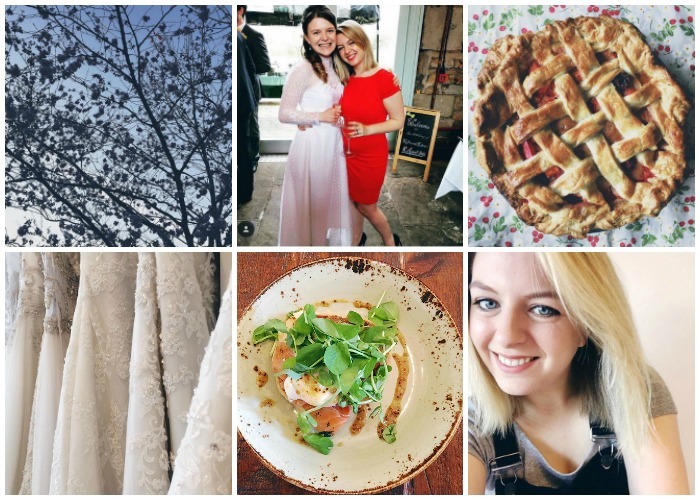 Changingmy attitude to blogging and feeling better for it. Crying at Katie & Ed's speech at their beautiful wedding. Making TV a much more social activity with Netflix nights (and Netflix brunches). Planning my Leeds Indie Food line-up. Fallingin love with Mr Darcy all over again. Listening to podcasts every day. How did I live without them? Buying new sofas like a real grown-up. Re-starting Game of Thrones Mondays. Battling with my birth control. What fun we have as women, eh? Performing my first bridesmaid duties - watching the bride try on dresses, Prosecco in hand! It's a tough life. Making salads, despite the weather being less than Spring-like. Helping Joe & Cheryl move to their new home. Stacking up the favours ready for our own move! Dining at Kendells to celebrate our anniversary. So happy to get there at last.